It’s our job to deliver and implement the most cost effective mobile solution for your business. Whether it’s a small site survey or a complex custom implementation project, our Professional Services team works closely with you to fully understand your environment and deployment strategy. We use this information to design a cost effective and reliable solution to maximise your investment and provide painless implementation. In keeping with how we implement a project we split it into 4 distinct phases: Design Phase, Deployment Phase, Management Phase and finally Support Phase. The design stage of every project is critical and involves defining each individual component of the solution based on the customer’s individual requirements. It involves gathering requirements information and creating the architecture design and defining an SOE for the mobility device in order for it to function correctly and integrate into the network. For wireless networks site surveys are completed and a report delivered in keeping with the corporate wireless LAN architecture standards to ensure it fully meets your needs. The definition of an SOE for the mobility device is an important step. Skywire engineers would work to optimise the device looking at firmware and operating system revisions/patches as well as understanding application needs such as security or lockdown. The goal of this phase is to define and proof the complete standard operating environment (SOE) for the solution, so that equipment is fully functional and optimised for use in the next phase – deployment. We use our industry knowledge and experience within supply chain and mobility to provide professional and technical advice on projects or solutions for our customers. We analyse the security of an existing or proposed wireless network. A wireless security survey report is produced which documents recommended security policies, current security weaknesses and wireless network advice to minimise your security risk. With a wireless site audit we conduct a wireless coverage check and investigate and analyse wireless performance. We look at mobile devices and access points, we record software versions being used and system configuration. All findings are documented with a clear conclusion and recommendations to resolve the identified issues. Our goal is to define and proof the standard operating environment (SOE) for the solution. Components are analysed and optimised. We look at firmware and operating system revisions and patches. We understand application needs such as security or lockdown, so that equipment is fully functional, locked down and optimised for deployment. As part of the initial deployment phase a pilot is necessary to prove and test the design of the solution thereby reducing the risk for full deployment. Once a pilot has been agreed as successful then the installation and deployment plan would be carefully agreed to ensure risk is minimised and project success is maximised. Deployment services include installation and cabling of wireless networks based upon the documented findings from the site survey report. Skywire engineers would then commission the network, which includes confirming the configuration is optimised and any mobile devices are fully connected and functional. For all deployments a consistent build quality and testing of devices prior to shipment is important. Skywire ensures all of the devices to be deployed are built to the same SOE image to ensure consistency and standardisation across the deployment. All devices would be fully tested as functional and operational before being deployed to site. Skywire would record all of the pertinent device information such as serial number, asset number, SIM card, and location as required. We work with you to build a pilot or proof of concept program with key objectives and outcomes. We then help setup, deliver and test the program in a production environment so that the project viability and risks can be assessed. A decision can then be made regarding full production deployment based upon the results from the pilot or proof of concept. We install, configure and test the most appropriate device management solution to enable you to manage your mobile devices effectively in the field. We supply and install network cabling and power for a wireless network. This also includes access point and antenna installation along with cable testing of the wired network. We commission the solution and equipment that has been supplied and deployed. This includes final configuration and end to end testing of the complete solution to ensure that the solution is working correctly and as expected ready for business operation. QA and Staging ensures that devices to be deployed are fully tested and configured with your custom SOE so that they are business ready for deployment. Your SOE image is loaded onto all units which are then tested. All units are configured, optimised and further tested across multiple functions and confirmed as ready for operation. All of the relevant device information such as serial number, asset number, SIM card, and dispatch location are recorded before units are shipped out. We provide a technical resource during the critical go-live period to assist with any troubleshooting and system optimisation required at such an important time. We can assist in helping you manage your assets by enabling asset management tools and providing ongoing reporting of asset movements, additions and changes. As part of the management phase of the solution Skywire would document and project manage the deployment of the rollout. This includes the documentation of the tested SOE and the device rollout information per site location. For managing your mobility devices Skywire recommends implementing a device management solution. Skywire would understand your requirements and suggest the most appropriate device management solution. Engineers would then install, setup, test and train in the use of the relevant device management solution. Skywire engineers would be involved in building and testing the device management packages to be deployed. Skywire trainers can develop a customised training program to support the introduction of the mobility project to ensure that users and operators are given the relevant information for the project. We help manage the solution ensuring that the project is completed smoothly, on-time, within budget and to spec. Our project managers are experienced in rugged mobility solutions therefore understand how to deliver this type of solution successfully. We provide solution and system architecture as-built documentation. Each component and its individual SOE are recorded as well as high level operational details. We also provide user guides and reference material upon request. We deliver a customised training program to support introduction, operation and support of a rugged mobility solution. 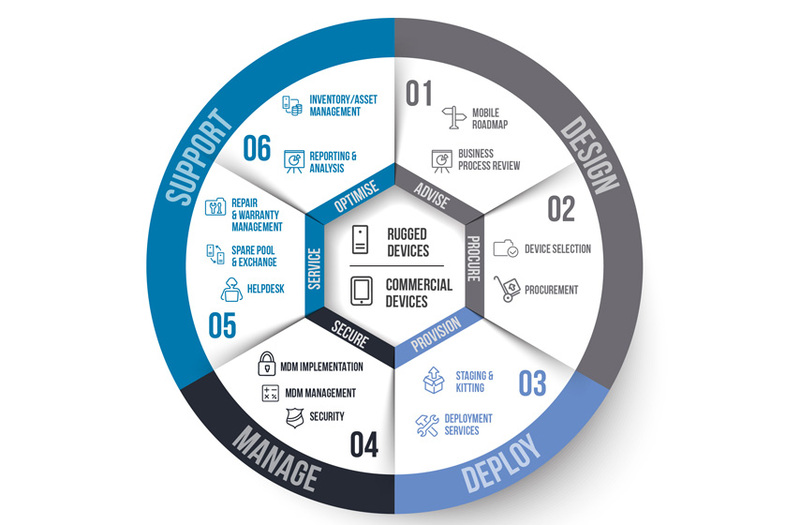 We help maintain your device management solution and work with you on the deployment of new SOE builds through the device management platform. We help build, test and deploy new software packages to the units in the field as required. We audit the integrity of an installed solution and understand user issues and concerns. If obvious problems exist, we will obtain approval to effect repairs and modifications as necessary. All findings are documented with a conclusion and recommendations to resolve any identified issues. Once a deployment has been completed then the solution is handed over to the support team to look after based upon an agreed Service Level Agreement (SLA) that clearly defines the responsibilities, the processes for support, response times, restoration times, device turnaround times, operational hours and other important information such as severity levels Skywire has its own service desk that currently support over 6,500 fully contracted mobile devices in the field for over 100 customers across over 150 different locations. All of which are based upon their own Service Level Agreements (SLA). The Skywire service desk system uses a fully featured ticketing system which enables us to track your request and ensure that it is resolved within your SLA response time. This service desk has been specifically tailored to meet the needs of our Australian and New Zealand helpdesk customers. The Skywire service desk is operated by level 1 and level 2 support engineers who are fully trained in the vendor‘s product suite. As well as the standard Skywire business hours support, we can also provide technical support out of hours depending on your needs. We have our own service desk that currently supports over 13,500 devices in the field across over 150 different customer locations. We use a fully featured ticketing system which enables us to track your request and ensure that it is resolved within your SLA response time. Our service desk is operated by level 1 and level 2 support engineers who are fully trained in the vendor product. As well as standard business hours support, we can also provide 24×7 support if required. Our online portal allows you to raise tickets, list your service contracts, check if a serial number is under contract, track your repair, check history and generate reports. Our portal is directly connected to vendor service centres which means we get automated vendor RMA numbers simplifying the often tedious repair management process. We setup monthly and quarterly reporting and schedule review meetings to discuss and analyse the report data focusing on historical performance and trends for continuous improvement. Maintaining and managing service contract compliance across all equipment can be difficult. We do this for you providing visibility and awareness of existing, upcoming, and expired contracts so that you have a clear picture of the maintenance contracts of your equipment. We provide a comprehensive support solution that saves you from having to deal with the difficult task of supporting a complex mobility deployment. With a fixed cost and a single point of contact the Skywire managed service means we do it all for you including maintaining a managed spares pool of equipment. We simplify the ongoing management and lifecycle evolution of your mobility solution. We make sure that you get the best out of your equipment today and also take advantage of the latest and newest products and features in the market. We manage and optimise the lifecycle of your equipment to enable you to deliver the service you need.